n a special one-off piece The Youth Radar writes in collaboration with journalist Jasper Taylor to document the England beach soccer scene and it’s attempt to raise its profile. You can view more of Jasper’s work here or follow him on Twitter. On Sunday 25th March the England Beach Soccer team gathered in Poole for their second training camp of the season. Europe tends to dominate the beach soccer scene, apart from the undoubted dominance of South American giants Brazil, but Europe only have four qualifying places in the bi-annual tournament. The national side was formed in 1995 but the sport was first played in England on the Isle of Wight. Jones told us “The sport was originally developed on Small Hope Beach. The guy who got the right to promote beach soccer just got some goals, painted them yellow and stuck them down the beach. Despite the rise in popularity of the sport, it has still not quite caught enough attentIon from FA Officials. “We have to have their permission to compete and wear the Three Lions. We don’t get financial support as in a monetary sense, we are just amateurs trying to be professional. We do get kit from Umbro. 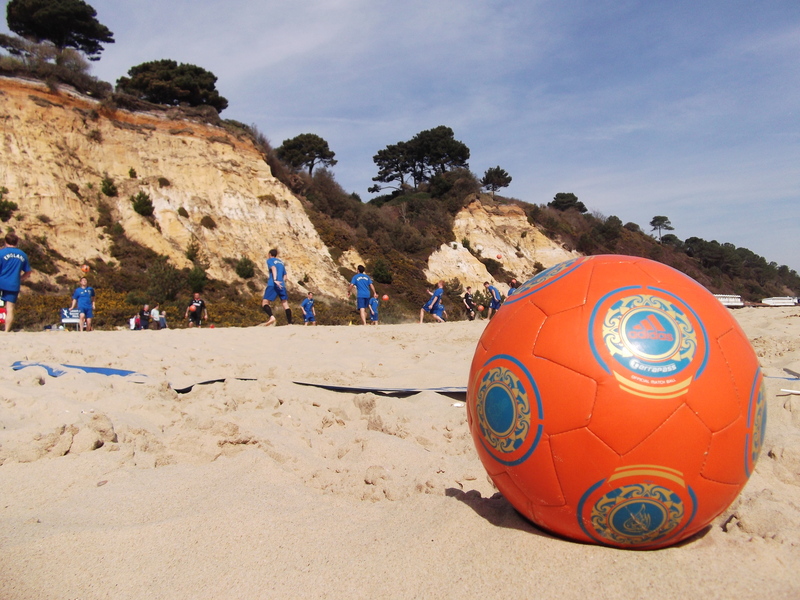 Dorset FA are currently in the process of developing the first UK mainland Beach Soccer League to be hosted at Poole Beach. Jones is also excited about the prospect of the league in Poole and believes it is “massive. We desperately needed it. We are a football nation.” And that nation will continue to grow with the inclusion of beach soccer and Poole beach acting as the catalyst to its popularity. The Poole Beach Soccer League will run for six weeks throughout the summer and will follow the same rules as normal beach soccer except games will last for a slightly shorter period. A women’s and junior league will also be established next summer in a bid to strengthen the reputation of this ever-growing sport even further. The official rules of Beach Soccer were created in 1992 after the beaches of Brazil were littered with acrobatic athletes who used the sand as the perfect canvas to showcase their footballing talents. Expect to see skill, agility and a some spectacular goals as the game averages a goal every three minutes. The sand provides a tricky surface which forces the players to use every part of their body. Overhead kicks and diving headers aren’t rare in this sport, so prepare yourself for a thrilling match. The pitch measures 28×37 metres, about a quarter of the size of a standard grass pitch. Each team consists of five players and up to five rolling substitutes. This lends itself to accelerating the pace and flow of the game. There are three quarters of twelve minutes in each match but if teams are level a three minute ‘Golden Goal’ period determines the winner. If the teams are still tied, a penalty shootout decides the victor. And of course, one of the main rules – no shoes! be hoped for, it was bad for your cardiovascular system, and that some amount of fat. Thanks for finally writing about >Poole: The Home of English Beach Soccer | The Youth Radar <Liked it!